PHOTO BY PAT GAIETTO Tiffin University’s Ali Schirmer shoots as Hillsdale’s Bree Porter gets a hand on the ball Saturday at Gillmor Center. Hillsdale found a way to paint the town Saturday. The Chargers beat Tiffin University 80-69 at the Gillmor Center. Of the 80 points Hillsdale scored, more than half of them — 41 — came for point-blank range. The Dragons were able to stay close with the Chargers most of the way, drawing even at 57 on a corner 3 by Allie Miller with 9:30 left in regulation. But the Chargers answered with a 13-3 run, and cruised from there. “Their guards hurt us in the paint as much as their posts,” Tiffin coach Jason Mishler said, after his team fell to 6-16, 4-11 in the Great Lakes Intercollegiate Athletic Conference. And one forward — and only one forward — hurt the Dragons from deep. 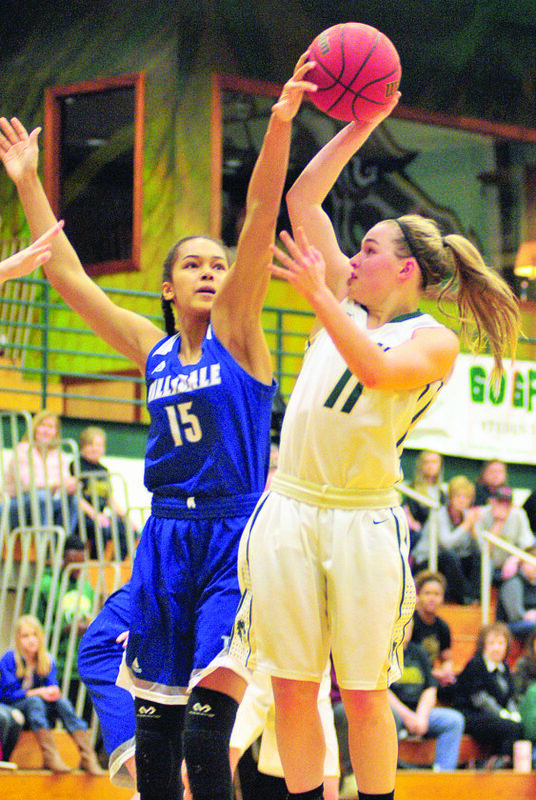 After TU tied the game at 57, Hillsdale’s McKenna Ott came down and drilled a 3. The Chargers were only 1 of 11 in the first half from 3. But Ott went on to hit four after the half, and finished with a game-high 19 points. “She was the only one looking to shoot from the perimeter,” Mishler said. Ott had five 3s in the game, but Tiffin had opportunities, even after the Chargers took the lead. Mishler was asked if taking the lead in the fourth quarter would have helped TU. As for the run that put away the Dragons, the coach said his offense wasn’t able to get much done. Hillsdame improved to 13-12, 7-11. Five Chargers scored in double figures, with Allie Dewire collecting 14 points and nine rebounds, and Allie Dittmer, Brittany Gray and Julia Wacker scoring 10 points each. Dittmer added nine rebounds, as the Chargers controlled the boards 44-34. The Dragons’ outside shooting kept them in the game. They went 13 of 32 from deep, with Sarah Cummings, Bre Nauman and Ali Schirmer making three treys each. Schirmer led the Dragons with 18 points and four assists, while Nauman had 17 points and eight boards. Deidre McKay had seven assists for Tiffin. The Dragons were outscored 41-16 in the paint. Cummings and Miller each had nine points for Tiffin; while Kristen Massey had eight. The Dragons have three games left, all conference matchups. Their next game is Thursday at Findlay. Mishler said he likes what he’s from his team, in games and in practice. “We haven’t even talked about the end of the season,” he said.